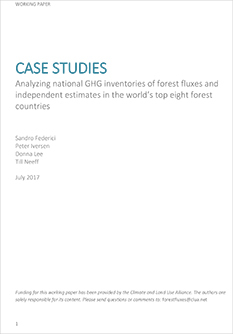 This report seeks to clarify which forest-related emissions and removals are (and are not) included in national GHG inventories submitted to the UNFCCC and to identify and explain divergences with independent studies, including those summarized in IPCC Assessment Reports. At the heart of the current confusion lies the distinction between anthropogenic and non-anthropogenic emissions and removals. On the one hand, most national GHGIs follow IPCC Guidelines and employ a proxy approach that estimates fluxes on “managed lands”, whereas emissions and removals that occur on the remaining “unmanaged lands” are not reported because they are assumed to be non-anthropogenic. On the other hand, IPCC Assessment Reports consider anthropogenic fluxes to be those caused by land use change or certain management regimes including harvesting and/or replanting, and identify most removals as part of the “residual terrestrial sink,” regardless of whether they occur on lands that national GHGIs identify as managed or unmanaged. 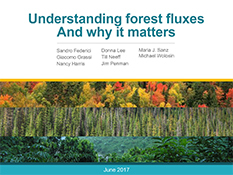 Divergences in estimates may also be due to differences in methodologies used to estimate forest fluxes, or incomplete measurements of them, particularly by developing countries. In recent years, REDD+ “readiness” funding has enabled substantial improvements in developing country data on deforestation, with substantial investments in capacity building, including training and technology. The report concludes that this progress must be maintained and expanded to include better data on forest degradation, regrowth, and restoration. 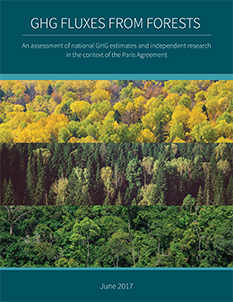 The report also suggests opportunities for reconciling these and other technical issues that should be addressed in the aftermath of the Paris Agreement, including practical steps that can be taken for country-level reporting and global-scale assessments to better monitor the role of forests in delivering on the promise of Paris. A working paper provides an initial assessment of disparities between government data and independent estimates of national scale forest GHG fluxes within a set of case studies. A more comprehensive assessment, i.e. one that reconciles estimates, would need to explore the assumptions implicit in the respective measurement methods, requiring the active collaboration of those who have made the estimates. Currently, there are few reports that provide a sufficient level of transparency on how calculations have been made in order to do so without such cooperation. The significance of these technical issues should not be under-estimated. Globally, forests remove at least 25% of global anthropogenic CO2 emissions. Nationally, reducing emissions from deforestation was the source of the single largest economy-wide, emission reduction between 2005 and 2012 (Brazil). Achieving Paris Agreement goals means that the forest sector will need to contribute even more to become a much larger net sink—if the world is to move to an overall carbon balance. Federici, S., Grassi, G., Harris, N., Lee, D., Neeff, T., Penman, J., Sanz, M.J., and Wolosin, M. (2017). GHG Fluxes from Forests: An assessment of national GHG estimates and independent research in the context of the Paris Agreement.